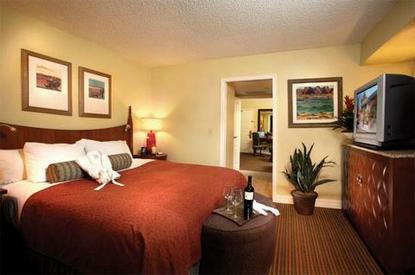 Announcing the newly renovated Pointe Hilton Squaw Peak Resort. After an extensive, resort-wide $24 million dollar renovation, we welcome you to enjoy the hospitality that is indigenous to the Hilton Hotels and Resorts throughout the world. The award-winning Pointe Hilton Squaw Peak Resort in Phoenix, Arizona is home to the Hole-in-the-Wall River Ranch - a water wonderland of family fun with acres of pools, waterfalls, a lazy river for tubing, waterslide, the prairie dog putting course, four lighted tennis courts and Coyote Camp - a children's adventure program. After a day outdoors in the Arizona sunshine relax at the completely renovated Tocasierra Spa, Salon & Fitness Centre. Spoil your body with treatments, relaxing massages, personal training or an invigorating workout.Arizona is famous for outdoor dining and the Pointe Hilton Squaw Peak Resort has just that at all of their restaurants. Whether on one of the two patios overlooking the beautiful mountains or in the authentic dining room, be sure to check out the Hole-in-the-Wall restaurant featuring a western-style menu for breakfast, lunch and dinner. Lantana Grille is a three-meal-a-day restaurant which serves all the food you love - familiar favorites with innovative Southwestern flair or if you don't want to leave your place in the sun, mosey on over to Slim Picken's at the River Ranch for some poolside grub.Guests of the Pointe Hilton Squaw Peak Resort in Phoenix, Arizona will enjoy relaxing in the beauty of the adjoining Mountain Preserve, while indulging in the luxurious services and activities that the resort has to offer. The 563 standard accommodations are spacious two-room suites that feature one king bed or two queens, the Hilton Serenity Bed & Bath Collection, as well as high-tech and high-touch guestroom amenities including the Hilton Alarm Clock Radio with MP3 capabilities. Set on a mountainside with panoramic views, this Spanish-style resort features 27 acres of beautifully landscaped grounds with downtown Phoenix a mere 10 miles away.The Pointe Hilton Squaw Peak Resort has more than 48,000 square feet of flexible function space, including three spacious ballrooms and 46 choices of conference rooms, meeting professionals enjoy a myriad of options including high-speed Internet access and a complete business centre. The varied technical needs of event planners and staff are met by our in-house audio/visual specialists. In the spirit of the outdoors, why not entertain your group with playful themed events at Tombstone, our cowboy town, or one of our garden patios?The Pointe Hilton Squaw Peak Resort is only eight miles from Phoenix's Sky Harbor International Airport. So, whether you came to Arizona for a successful meeting, recreational getaway or essential escape, Phoenix and the Pointe Hilton Squaw Peak Resort will always call you back.Travel Should Take You Places.